Vitamin B12 deficiency can cause a decrease in the formation of DNA, which is necessary for the reproduction of cells. Blood cells and nerve cells reproduce fast, which is why the effects of a deficit are noticed first in these types of cells. One of the symptoms of anaemia is tiredness. When lack of B12 affects the nerve cells it can cause tingling and numbness in the limbs. It may take several years of a vitamin deficiency to show up as a health problem with the above symptoms. 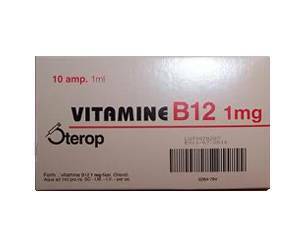 Vitamin B12 is mainly found in meat, fish, eggs, milk and cheese. Some people are unable to absorb enough vitamin B12 from food due to a gastrectomy, lack of stomach acid or bowel disorder such as coeliac disease. A vegetarian or vegan diet may cause a vitamin B12 deficiency, but this is very rare and only occurs after years and years of eating fewer animal products. If the deficiency is caused by poor absorption by the body, vitamin injections are needed. In this case, taking tablets will not cure the problem. Vegetarians and vegans are usually able to supplement their vitamin deficiency with tablets. At Dokteronline.com, you can order Hydroxocobalamin HCl CF 500 mcg/ml x 1 ml amp solution for injection, five vials per pack. Please be informed that this medicine must be transported cold. Unfortunately, Dokteronline.com is unable to offer a refrigerated transport service and therefore cannot guarantee the effectiveness of this product.